Seller will give you a gift certificate in the amount of 43,8 RUB for a positive review of the product purchased. 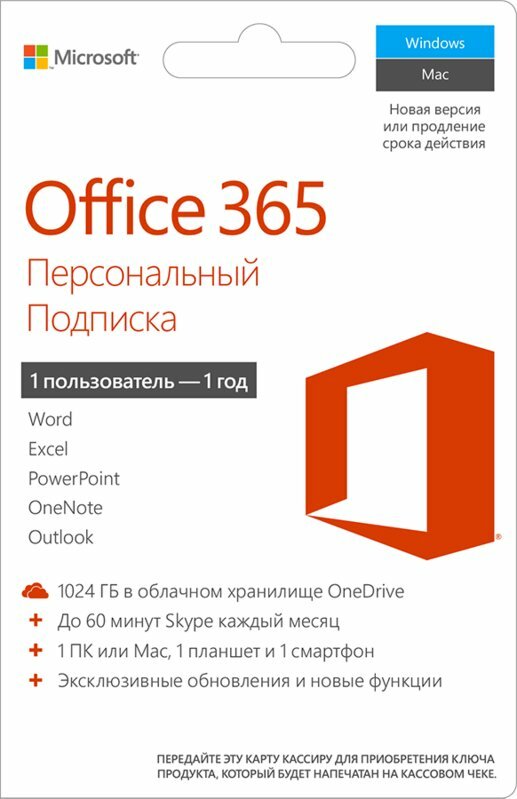 Microsoft Office 365 Personal - Subscription for 1 PC + 1 tablet for 12 months (electronic delivery, article QQ2-00004). The registration key you receive immediately after payment in the window after the payment. Get reliable and familiar installable applications: Word, Excel, PowerPoint, OneNote, Outlook, Publisher, Access. Install full-featured Office applications on one PC or Mac, one tablet and one phone (including Windows, Apple® and Android ™ devices). 1 TB of space in the cloud storage OneDrive, as well as 60 minutes of Skype monthly for calls to mobile phones and fixed telephones. FOR ACTIVATION IN THE TERRITORY OF THE CIS AND GEORGIA. Microsoft Office 365 Personal (Personal) is an option for subscribing to a Microsoft Office suite for one user. The solution is a subscription to popular office applications: Outlook, Excel, Word, PowerPoint, Publisher, Access and OneNote. Subscription provides the ability to connect 1 tablet or 1 computer (PC or Mac). To work with Office 365, you only need to connect to the Internet: register, create personal settings, work with documents and stay connected always at home and on the road. Office 365 Personal is great for 1 PC or Mac computer and 1 tablet. With it, you can work almost anywhere in the world using all your devices. You always use the most current software and you do not need to think about replacing obsolete versions of programs. Install completely new versions of 2016 of all applications - Word, Excel, PowerPoint, OneNote, Outlook and others - by downloading them directly to your favorite devices. You can continue to work even if you disconnect the device from the Internet *. * - The availability of applications and functions depends on the platform, device and language. The Publisher and Access applications are only available for the PC. Use all Office features on 1 PC or Mac, 1 Windows tablet, iPad or Android and 1 phone **. ** - Compatible with Windows 7 and later and OS X 10.10. A complete list of system requirements, including requirements for tablets and smartphones, can be found at http://www.office.com/information. Use the OneDrive cloud storage for instant access to your documents, photos and videos. Edit the materials and share them on the Internet at any time, anywhere and with the help of any of your devices. The license includes all the updates, so you will always receive new versions of applications as soon as they are released. Word - Create and edit great documents, and also provide access to them. Excel - Use new, intuitive ways to analyze and visualize data. PowerPoint - Create, collaborate and find an effective idea for your ideas. OneNote - Turn your laptop into a powerful tool for expressing your own ideas. Outlook - Put in order in your e-mail, agree working schedules and stay in touch with people from your contact list. OneDrive - Get 1TB of space in the OneDrive cloud storage for all your files. Skype - Call mobile and landline phones, using 60 minutes for Skype calls every month. Seller will give you a gift certificate in the amount of 43,8 RUB for a positive review of the product purchased..